For other uses, see Pantanal (disambiguation). The Pantanal (Portuguese pronunciation: [pɐ̃taˈnaw]) is a natural region encompassing the world's largest tropical wetland area. 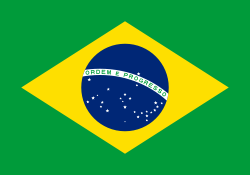 It is located mostly within the Brazilian state of Mato Grosso do Sul, but it extends into Mato Grosso and portions of Bolivia and Paraguay. It sprawls over an area estimated at between 140,000 and 195,000 square kilometres (54,000 and 75,000 sq mi). Various subregional ecosystems exist, each with distinct hydrological, geological and ecological characteristics; up to 12 of them have been defined (RADAMBRASIL 1982). Roughly 80% of the Pantanal floodplains are submerged during the rainy seasons, nurturing an astonishing biologically diverse collection of aquatic plants and helping to support a dense array of animal species. The name "Pantanal" comes from the Portuguese word pântano, meaning wetland, bog, swamp, quagmire or marsh. By comparison, the Brazilian highlands are locally referred to as the planalto, plateau or, literally, high plain. The Pantanal is a huge, gently-sloped basin that receives runoff from the upland areas (the Planalto highlands) and slowly releases the water through the Paraguay River and tributaries. The formation is a result of the large, concave pre-Andean depression of the earth's crust, related to the Andean orogeny of the Tertiary. It constitutes an enormous internal river delta, in which several rivers flowing from the surrounding plateau merge, depositing their sediments and erosion residues, which have been filling, throughout the years, the large depression area of the Pantanal. 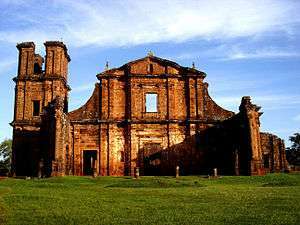 This area is also one of the distinct physiographic provinces of the larger Parana-Paraguay Plain area. The Pantanal is bounded by the Chiquitano dry forests to the west and northwest, by the Arid Chaco dry forests to the southwest, and the Humid Chaco to the south. The Cerrado savannas lie to the north, east and southeast. The Pantanal has an average yearly rainfall of 1,000–1,400 mm (39–55 in), but is fed by the upper Paraguay River. Its average temperature is 25 °C (77 °F), but temperatures can fluctuate from 0 to 40 °C (32 to 104 °F). Floodplain ecosystems such as the Pantanal are defined by their seasonal inundation and desiccation. They shift between phases of standing water and phases of dry soil, when the water table can be well below the root region. Soils range from high levels of sand in higher areas to higher amounts of clay and silt in riverine areas. Elevation of the Pantanal ranges from 80 to 150 m (260 to 490 ft) above sea level. Annual rainfall over the flood basin is between 1,000 and 1,500 mm (39 and 59 in), with most rainfall occurring between November and March. 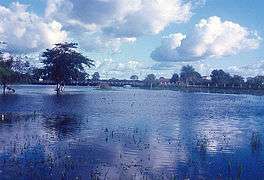 In the Paraguay River portion of the Pantanal, water levels rise between two meters to five meters seasonally; water fluctuations in other parts of the Pantanal are less than this. Flood waters tend to flow slowly (2 to 10 cm (0.79 to 3.94 in) per second) due to the low gradients and high resistance offered by the dense vegetation. When rising river waters first contact previously dry soil, the waters become oxygen-depleted, rendering the water environs anoxic. Many natural fish kills can occur if there are no oxygenated water refuges available (the reason for this remains speculative: it may be due to the growth of toxin-producing bacteria in the deoxygenated water rather than as a direct result of lack of oxygen (McClain 2002)). The vegetation of the Pantanal, often referred to as the "Pantanal complex", is a mixture of plant communities typical of a variety of surrounding biome regions: these include moist tropical Amazonian rainforest plants, semiarid woodland plants typical of northeast Brazil, Brazilian cerrado savanna plants and plants of the Chaco savannas of Bolivia and Paraguay. Forests usually occur at higher altitudes of the region, while grasslands cover the seasonally inundated areas. The key limiting factors for growth are inundation and, even more importantly, water-stress during the dry season. The Pantanal ecosystem is home to 3500 known plant species. Wikimedia Commons has media related to Animals of the Pantanal. The Pantanal ecosystem is also thought to be home to 1000 bird species, 400 fish species, 300 mammalian species, 480 reptile species and over 9000 different subspecies of invertebrates. The apple snail is a keystone species in Pantanal's ecosystem. When the wetlands are flooded once a year, the grass and other plants will eventually die and start to decay. During this process, decomposing microbes deplete the shallow water of all oxygen, suffocating larger decomposers. Unlike other decomposing animals, the apple snail have both gills and lungs, making it possible for them to thrive in anoxic waters where they recycle the nutrients. To get oxygen they extend a long snorkel to the water surface, and pumps air into their lungs. This ability allows them to consume all the dead plant matter and turning it into nutritious fertilizer available for the plants in the area. The snails themselves are also food for a variety of animals. Among the rarest animals to inhabit the wetland of the Pantanal are the marsh deer (Blastocerus dichotomus) and the giant river otter (Pteroneura brasiliensis). 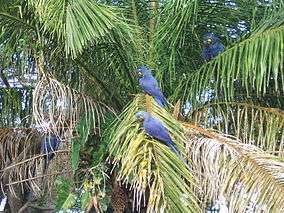 Parts of the Pantanal are also home to the following endangered or threatened species: the hyacinth macaw (Anodorhyncus hyacinthinus) (a bird endangered due to smuggling), the crowned solitary eagle, the maned wolf (Chrysocyon brachyurus), the bush dog (Speothos venaticus), the South American tapir (Tapirus terrestris) and the giant anteater (Myrmecophaga tridactyla). Common species in the Pantanal include the capybara (Hydrochoerus hydrochaeris) and the yacare caiman (Caiman yacare). According to 1996 data, there were 10 million caimans in the Pantanal making it the highest concentration of crocodilians in the World. The Pantanal is home to one of the largest and healthiest jaguar (Panthera onca) populations on Earth. Most fish are detritivores, primarily ingesting fine particles from sediments and plant surfaces. This is characteristic of fish living in South American flood-plains in general. Fish migration between river channels and flood-plain regions occurs seasonally. These fish have many adaptations that allow them to survive in the oxygen-depleted flood-plain waters. In addition to the caiman, the following reptiles inhabit the Pantanal: the yellow anaconda (Eunectes notaeus), the gold tegu (Tupinambis teguixin), the red-footed tortoise (Geochelone carbonaria) and the green iguana (Iguana iguana). The Pantanal region includes essential sanctuaries for migratory birds, critical nursery grounds for aquatic life, and refuges for such creatures as the yacare caiman, deer, and Pantanal jaguar. Commercial fishing: Fishing is focused on only a few species and is probably not sustainable. National and international sport fishing: The Paraguay river and its tributaries are the main focus for fishing activities. Approximately 99% of the land in the Pantanal is privately owned for the purpose of agriculture and ranching. There are 2500 fazendas in the region and up to eight million cattle. Erosion and sedimentation caused by this activity alter the soil and hydrological characteristics of Pantanal flood-plain ecosystems; consequently, native species are threatened by the change in ecosystem variables. Hunting, poaching, and smuggling of endangered species: Reptile, wild cat and parrot species are particularly at risk from the smuggling industry due to their high value on the black market. 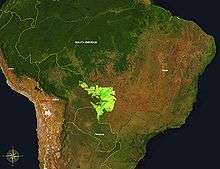 Deforestation is more relevant to elevated areas of the Pantanal which contain forest stands than lowland grassy areas. Silt run-off from deforested highlands alters soil hydrology and is a significant threat to the Pantanal. The Pantanal is a natural water treatment system as it removes chemicals, including pollutants, from water. Overpollution from industrial development (especially gold mining) can harm native flora and fauna. However, water quality in the Pantanal was not significantly impacted as of 2002. Infrastructure development (shipping canals, raised roads, pipelines): The proposed plan to dredge the Paraguay and Paraná Rivers to allow oceangoing ships to travel 3,442 kilometres (2,139 mi) inland is of particular concern and could affect the hydrology (flooding and drainage cycles) of the region, and therefore impact the ecosystem. A portion of the Pantanal in Brazil has been protected as the Pantanal Matogrossense National Park. This 1,350 square kilometres (520 sq mi) park, established in September 1981, is located in the municipality of Poconé in the State of Mato Grosso, between the mouths of the Baía de São Marcos and the Gurupi Rivers. This park has been designated a Ramsar Site of International Importance under the Ramsar Convention since May 24, 1993. The SESC Pantanal Private Natural Heritage Reserve (Reserva Particular do Patrimonio Natural SESC Pantanal) is a privately owned reserve in Brazil, established in 1998 and 878.7 km2 (339.3 sq mi) in size. It is located in the north-eastern portion, known as "Poconé" Pantanal, not far from the Pantanal National Park. 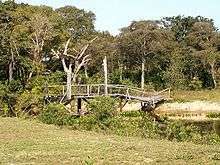 It is a mix of permanent rivers, seasonal streams, permanent and seasonal floodplain freshwater lakes, shrub-dominated wetlands and seasonally flooded forests, all dedicated to nature preservation, and was designated a Ramsar Site of International Importance under the Ramsar Convention. Otuquis National Park and Integrated Management Natural Area is a national park of Bolivia in the Pantanal. Pantanal appears as a natural wonder in the strategy game Civilization 6. John Grisham's novel The Testament largely takes place in the Pantanal. Pantanal is the title of a Brazilian-produced telenovela whose setting is the Brazilian Pantanal. The Jack McKinney Robotech novel Before the Invid Storm makes reference to former soldiers of the Army of the Southern Cross called the Pantanal Brigade by the character Major Alice Harper Argus. The Twilight Saga: The Amazon Coven: "The Amazon coven consists of three sisters, Kachiri, Zafrina, and Senna, all natives of the Pantanal wetlands." 1 2 3 4 5 6 7 8 9 10 11 12 13 14 15 16 17 McClain, Michael E. (2002). The Ecohydrology of South American Rivers and Wetlands. International Association of Hydrological Sciences. ISBN 1-901502-02-3. Retrieved 2008-08-31. ↑ Keddy, Paul; Fraser, Lauchlan (2005). 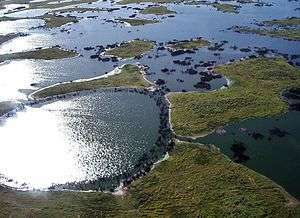 The World's Largest Wetlands: Ecology and Conservation. Cambridge University Press. Retrieved 2008-08-31. ↑ Rhett A. Butler. "Pantanal, the world's largest wetland, disappearing finds new report". mongabay.com. Retrieved 2006-01-10. ↑ "The World's largest wetland". The Nature Conservancy. Retrieved 2008-01-21. ↑ "Feeding and growth of apple snail Pomacea lineata in the Pantanal wetland, Brazil--a stable isotope approach.". 2002. Retrieved 9 September 2016. ↑ "Apple Snail: Unlikely Hero of the Pantanal". Nature Box. Archived from the original on 1 June 2016. Retrieved 9 September 2016. ↑ "BBC Two - Secrets of our Living Planet, Waterworlds, Enter the apple snail". BBC. 1 July 2012. Retrieved 9 September 2016. ↑ Frederick A. Swarts 2000, p. 7. 1 2 Willink, Philip W. (2000). A Biological Assessment of the Aquatic Ecosystems of the Pantanal. University of Texas. Retrieved 2008-08-31. 1 2 3 4 Brendle, Anna (January 10, 2003). "Behind Threats to World's Largest Freshwater Wetland". National Geographic News. pp. 1–2. Retrieved August 23, 2011. ↑ Araras Eco Lodge. "Pantanal - Brazil's undiscovered wilderness". Ladatco Tours. Retrieved 2008-01-22. 1 2 3 "Pantanal". Terrestrial Ecoregions. World Wildlife Fund. Retrieved August 23, 2011. ↑ Gunther, Michel. "The Threats of Dams and Navigation Infrastructure on La Plata". 10 Rivers most at Risk. WWF. Retrieved August 23, 2011. ↑ The Twilight Saga: The Official Illustrated Guide p. 185. Wikivoyage has a travel guide for Pantanal. Brazil's other great wilderness Guardian travel article, September 10, 2005. Guidelines for the Coexistence between People and Jaguars - illustrated guide for free download (in Portuguese and Spanish).